Why is it that the Italians seem more in touch with sensuality than just about anybody else? One dandy on a Vespa saying, “Ciao,” is enough to make other men seem like eunuchs, and what woman today can compare with self-possessed beauties like Sophia Loren, Gina Lollobrigida and Monica Belluci? Really, self-possession is the sexiest thing of all, and the Italians have it in spades. Take this design study, for example. This is the Italian firm Guigiaro’s study for the Ford Mustang. Guigiaro is a design studio that is responsible, along with Pininfarina, for the majority of the supercars past or present, including Lamborghini, Ferrari, Maserati, along with others cars for various companies (the Lexus GS400 of ’98-’05, for example). The problem of how to update the previous incarnation of the Mustang, an insipid little Po-mo smirk and riff, was how do you improve what is essentially the design equivalent of a smirk? Smirk harder? The car came from the design school of J Mays, also known as the man who designed the new VW Beetle, and who was the fourth recipient of the GSD’s Annual Design Award, after Rei Kawakubo of Comme des Garcons and Phillip Starck. In his acceptance speech (which I attended in Piper Hall in 2000), J Mays said that he does not differentiate between design and marketing. But what the Italians did here is make the Mustang, a perennially brute, dismissive, incompetent and uncomprehending, a thoroughly American car, into an Italian car. Problem solved. 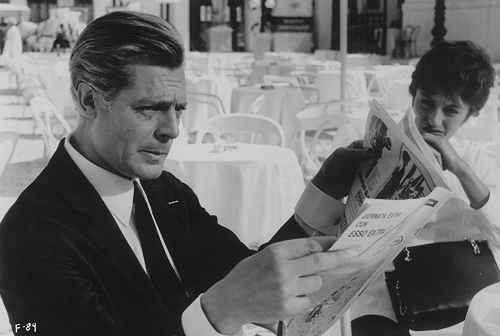 8 ½ is a film about a filmmaker, Guido, played by Marcello Mastroianni, who is struggling to find inspiration and motivation to complete his latest studio project, I mean, film. He is “a man exhausted by his evasions, lies and sensual appetites.” It sounds thoroughly Italian, and the rest of the film deals with his process of artistic struggle, which weaves through his dreams, his sexual life, and his relation to his friends and clients. It is a film that has been the subject of many dissertations. This is, then, a film about writer’s block. Or, as may be more generally termed to relate to filmmakers and architects, artist’s block. The thing is: I’m less and less tolerant of the idea of artist’s block. I used to think that manifesting struggle, i.e., throwing fits of despair and tantrums of tiredness, were the necessary by-products of any artist engaged with the creative struggle. But inherent in any creative act is the idea of struggle, and to cease production is essentially an outward expression of self-indulgence. This is not to say that inspiration should come at all times, nor is it to say that inspiration is meaningless. It simply is to say that you cannot bank on it, whether it comes or not is beyond control, and to stop working benefits neither self nor others.